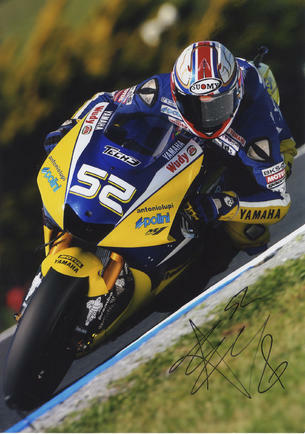 This is a hand signed 12" x 8" Colour photograph by the retired Motorcycle Racer who won the 2007 Superbike Championship. James Michael Toseland (born 5 October 1980) is an English former motorcycle racer. Toseland was the 2007 World Superbike Champion on a Ten Kate Honda, and also won the 2004 Superbike World Championship on a Ducati. He is one of only two men, the other being Troy Corser, to have won the World Superbike Championship for two different manufacturers. On 9 September 2011 he officially retired from professional motorsport due to a wrist injury sustained in March 2011 at an official World Superbike Championship testing session at Motorland Aragon, Spain. Aside from racing, Toseland is a keen pianist (reaching Grade 6) and singer-songwriter who, until recently, performed regularly with his band Crash at gigs across the world. However, Toseland is also a talented solo artist and in the past has performed alongside Ray Stubbs for BBC's Sport Relief and played a piano set at the British sports personality of the year awards in 2007.